Steve Tant of Nightbeat sent in this story. With 10 minutes until show time at Nightbeat 2005, we discovered that the CD for the National Anthem was missing. The clock was ticking. Jason Rutledge of the Memphis Sound will be performing our National Anthem". The Air National Guard Color Guard approached and presented the colors as Jason stepped out and faced the American Flag. Without a warmup of any kind, he delivered a performance of professional caliber. After the ensuing standing ovation, Steve Rondinaro explained to the fans, "Now, what you don't know is Jason found out just a few minutes ago that he was singing the National Anthem tonight." Jason received another well-deserved standing ovation. Jason is a senior at the University of Arkansas at Fayetteville majoring in history, where he has spent four years in their marching band. 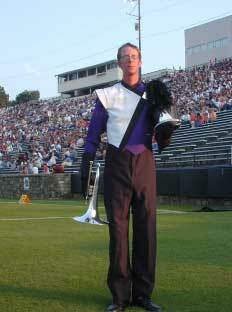 Jason is a rookie/ageout mellophone player for Memphis. His dad, Keith Rutledge, runs the Northwest Arkansas Summer Music Games in Siloam Springs, Ark. The Crown events Committee sincerely thanks Jason Rutledge and corps director Trey Moore of the Memphis Sound for helping us out in a pinch and giving our fans a great performance!